Now that the weather is glorious — warm and low humidity — mom has been working her way through the yard picking weeds. By 'weeds' I mean everything that looks dead and any plants that look out of place. 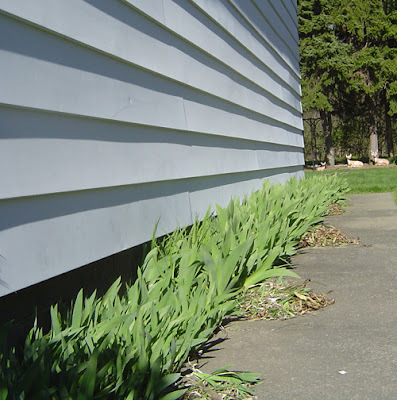 In the photo, you can see the little piles of weeds and other stuff mother dear has pulled out of the irises planted along the garage. She's been over it twice. When she's inside in the morning and evening, she talks about how she needs to get over there and "finish that side." As you can see, she did a GREAT job. Couple Alzheimer's with an OCD penchant for picking at things at ground level and you've got a clean garden. Last year, I planted seven bare-root rose bushes. Five climbers along the neighbors chain link fence that separates our yards (runs along the right side of the above photo just out of frame) and two hybrid teas on the other side of the house with the daffodils. Well two of the climbers didn't make it to summer as mom pulled them up 'cause they "were dead." The remaining plants did eventually bud and grow but we only had one flower amongst the three plants. I think they were getting established. The two hybrid teas, one of them my favorite Double Delight (pic to right), provided many sweet smelling flowers. This year, mom kept talking about the remaining three climbers. The winter wasn't kind to them. She just can't wait to yank them up. You can tell she has it on her mind — she must pull them up. I keep telling her to give them a chance because they could still make it. And I remind her that she killed two last year before their time but that means nothing to her. Today was the day she got to them when I wasn't around. I'm sad to report that all climbing roses have now been pulled up by the roots. "What do you want me to do with these," she asked with bushes in hand. "You're the one that yanked 'em up so you should have had a plan before you did that," I replied to deaf ears. She dropped them in one of the flower bed and trundled on looking for the next item she could uproot. Last fall I bought a lot of perennials at Lowe's for 90% off around the beginning of September. I think I put in about 30 plants. For that price, I reasoned, I didn't care if they were shot for the season...they'd be back in the spring. Well you-know-who couldn't wait for them to sprout and show any signs of life so a lot of them have met an early death as well. These are the things that frustrate me. I know she doesn't know any better but it still makes me angry that I work so hard to make the yard beautiful and she follows behind me and ruins it. Argh! Your last 2 posts make me laugh with understanding. I feel your frustration. My mother will cut the lights off as soon as you walk out the room. No matter that you are coming right back. And everyone has learned not to go out the door for a moment without keys. As soon as she sees it open, she shuts and locks it. sigh, here i am with perhaps another useless idea...but MAYBE some low fencing or trelis type thing to cu off or diliniate the flower beds..OR even a special patch JUST FOR HER. Not that she would remember..but like a "little boy" maybe she could relate to the cooked up story that "you want YOUR OWN and she can have hers. It has got to be frustrating..living where you can garden and still have "gophers" Here in the high desert i have surrendered to the elements and only grow irises and some Xeoroscape grasses...good luck YOY !